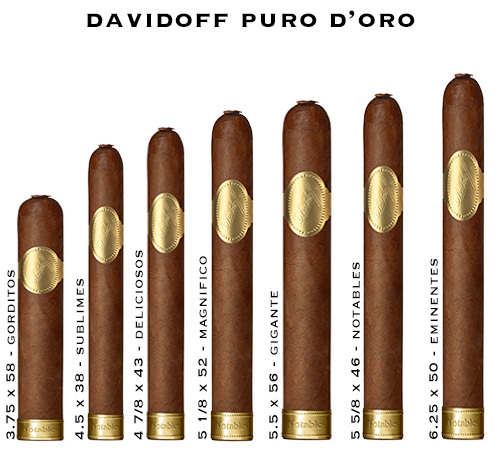 Davidoff Puro d Oro Cigars - Buy Premium Cigars Online From 2 Guys Cigars . Puro d’Oro, launched in 2010, was the culmination of the longest cigar development in the history of Davidoff. Hendrik “Henke” Kelner, the Davidoff Master Blender, spent more than 10 years growing and perfecting this outstanding series which was the first to be entirely produced by Dominican tobaccos. Its single origin components feature the outstanding Davidoff Yamasá™ wrapper developed exclusively for this series. The Davidoff Puro d'Oro lets the bold, heady notes of the Yamasà™ wrapper inspire you and the rich, spicy aroma of the filler leaves fill your time, and senses, beautifully. The tasting notes strike a balance between the heady aromas of espresso, chocolate and nuts with the earthy undertones of pepper and spices.